Apart from the Village Cinema screenings coming up (see our posts about that) we have a rolling programme of other fundraising events. 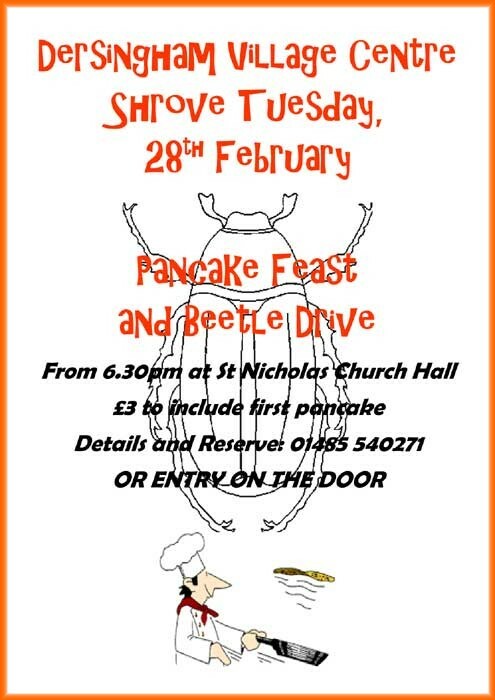 Next on the horizon is a Pancake Feast and Beetle Drive, a bit of lighthearted entertainment to coincide with Shrove Tuesday. The cost is just £3 and that includes your first pancake free. Don’t miss it! Phone 01485 540271 to reserve a ticket, or pay on the door. The fun starts at 6.30pm on Tuesday 28th February. Looking further to the future, here are some fundraising dates for your diary! Tuesday 28th February, from 6.30pm. Pancake Feast and Beetle Drive. Saturday 25th March 2.00pm. Afternoon tea dance. Saturday 8th April from 2.30pm. Easter family fun afternoon. Friday 21st April 8.00pm. Race Night at Dersingham Social Club. Except for the Race Night all events are held in St Nicholas church hall, which is, of course, to be replaced by the new Village Centre. More details of these future events, including how to book, will be published here as soon as possible. Don’t forget that our own Village Centre Lottery is also a great way to support the project and you might win one the the three prizes every month. You can find an application form to subscribe to the Lottery here and below you will see the winning numbers from the last few months.